Are you looking for natural stone care in NYC? If so, Statewide Stone Care is a professional natural stone care company providing customers with over 10 years of natural stone care in NYC. We offer a variety of services for both homes and businesses throughout New York and surrounding areas. No matter what condiiton our experts find your stone floors or countertops in, we promise to perform efficient stone services to restore the beauty in your environment. At Statewide Stone Care, we provide services for several different types of natural stone including marble, granite, limestone, travertine and terrazzo. All of these natural stones are extremely durable and are guaranteed to last for a lifetime of use. Unfortunately, the surface of your natural stone can get scratched or damaged and become dull from constant use. Our natural stone care in NYC will maintain the lustrous and smooth surface of your floors and countertops to make your natural stone appear new again. For more information on natural stone care in NYC, call Statewide Stone Care at 1-888-574-5595. 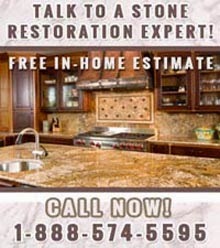 Ask about our free natural stone service quote today!